Pour the oil into a medium pan and add the garlic once the oil is hot. Cook for 2 minutes. Add the capers, artichoke hearts, mix well with a wooden spoon and cook for 2 more minutes. Add the wine, the zest and juice, salt and pepper. Lower the heat and let the wine reduce fro 10 minutes more, add the basil and stir well. Remove from the fire. In the meantime, prepare the pasta. Add a pot to the stove with water and 1 teaspoon of oil. When the water boils, add the pasta and cook at medium heat for 11 minutes or the time required by the packaging. Strain the pasta in a colander, return it to the pot, add the sauce, stir in a folding motion and serve over a bed of spinach (fresh, sautéed or steamed). Add a slice of salmon to complete the dish and satisfy your appetite. Cook the salmon on the grill with salt and dill. Don’t forget to follow the instructions on the package of pasta. Whole-wheat pasta requires more time than traditional pasta. Mix the sauce in with the pasta in the pot to spread the flavors evenly. You can use fresh spinach or sautéed frozen spinach as a bed for the pasta with a bit of olive oil and mashed garlic. Eating well doesn’t mean eating less. You can enjoy your favorite dishes in moderation. Start your day with a good breakfast and keep a balanced diet for the rest of the day. Today I’m sharing a smart and tasty recipe with nutritious and delicious ingredients that give your body the energy it needs. 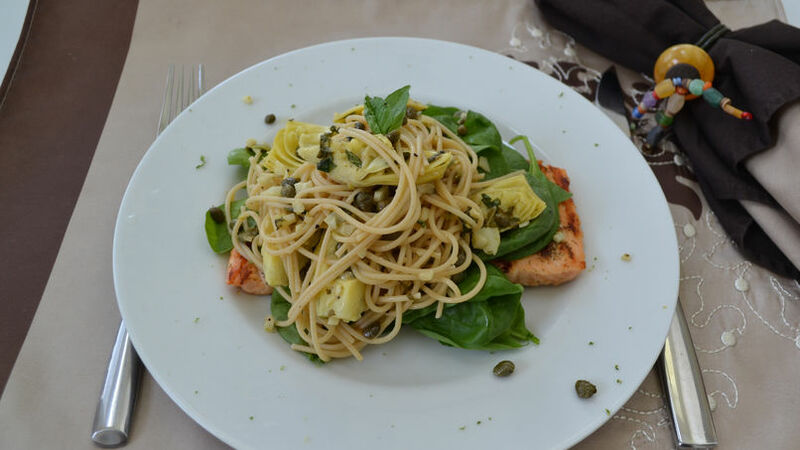 This recipe is for whole-wheat pasta and sauce with artichokes, capers and lemon, along with other ingredients. The pasta is served on a bed of spinach, creating a complete dish with all the necessary nutritious properties.